Struck pay-dirt for a deer tag in Nevada. With three bonus points, I figured my odds were pretty good. Now the rest of the story. The hunt is a muzzleloader hunt and I don’t even own a rifle. I guess I’ll be taking the crash course over the next couple months. I’ve fired a muzzleloader one time and didn’t do too well. It will be an interesting ride. I’ll be hunting the Cortez Mountains in September. I’m familiar with the territory and there are a few big bucks, but they’re hard to find. I appear to be growling as I kneel over this six-point bull. A neck shot drained the blood from this bull quickly and I heard him drop with a thud. 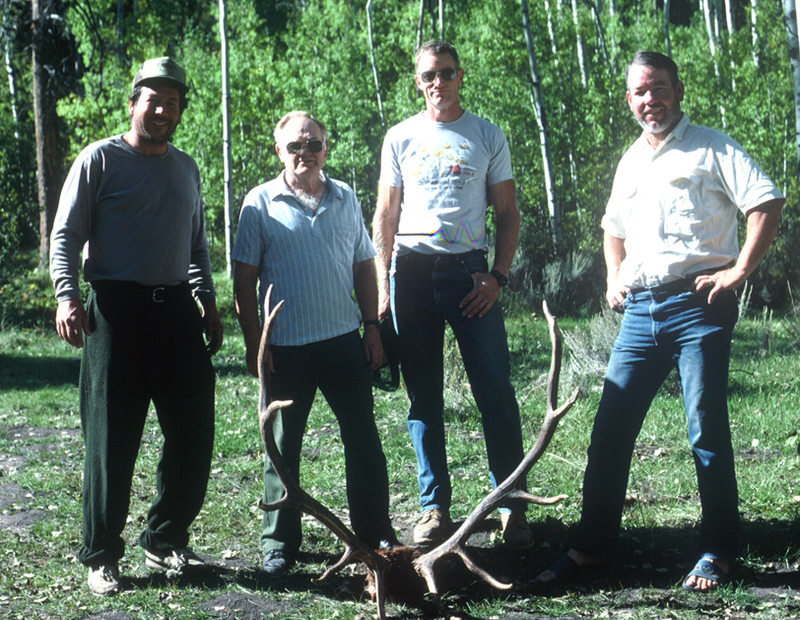 Rob dropped me off in darkness at the base of one of two Idaho mountains we called The Bookends – The Books for short. We each had our own mountain, but I wasn’t too sure about mine. 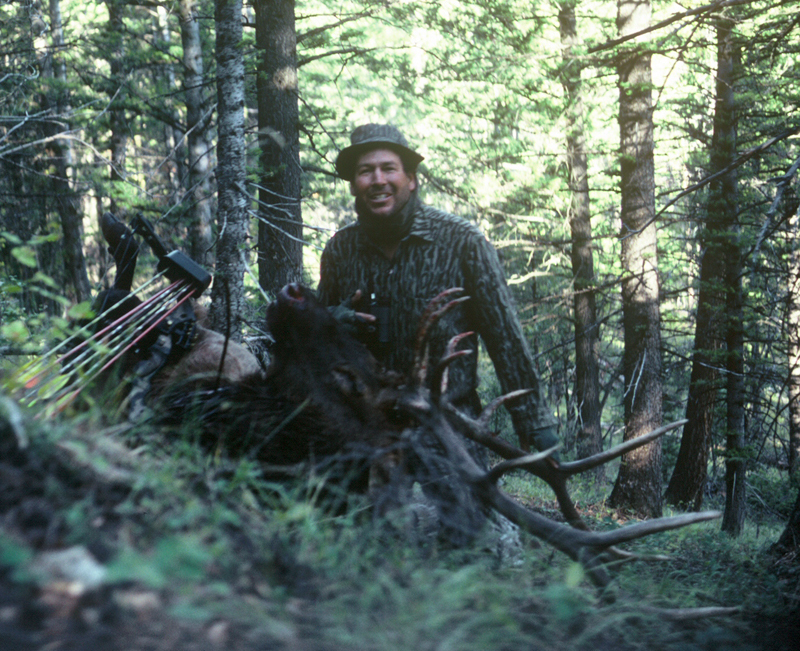 I’d hunted it once or twice before, but found no elk. The climb up the back side of the mountain would put the wind in my face, but I realized I’d left my grunt tube behind, so I’d be bugling into my cupped hands at best. I was not optimistic about my chances. As I reached the elevation I prefered for hunting, I listened for elk. With no encouragement from me, a bull elk bugled from up wind. What luck. I looked around and picked a good spot to kneel. I preferred kneeling over standing as the lower profile doesn’t spook the elk as readily. It couldn’t have happened any better. I bugled using my mouth diaphragm and the bull answered. Making no other sound, I waited and a very large bull elk sauntered up to me. He stooped broadside at 15 yards and I drew my bow. He caught the movement and turned to look in my direction. Before he could do anything else, I released my arrow and it penetrated deep into his neck. No, not where I was aiming, but it did the job. The one-bull elk stampede lasted for about fifteen seconds before he crashed – a big crash. When I walked up to him, he was a bloody mess, but I let out a whoop of joy anyway. Having nobody around to help me hoist him into a more appropriate position, I set the camera up and took the picture with him upside down, just as he had landed on the steep hillside. That's me on the left and Rob on the right. I can't remember the names of the two guys in the center of the picture. We enjoyed their company as they hunted from the same camp as us for several years.